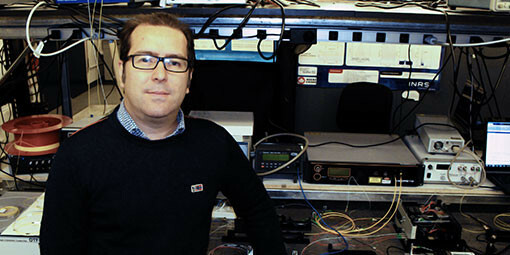 Fabio Grazioso received his Master degree (laurea magistrale) in physics in 2004, from University of Naples “Federico II” (Italy), defending an experimental thesis with the title: “Realization of an Optical Parametric Oscillator with poled crystal for an infrared spectroscopic apparatus”. This thesis research project was supervised by prof. Salvatore Solimeno. He then worked for two years as research specialist in the R&D lab of “duepigreco s.r.l.”, developing a prototype for a Quantum Key Distribution cryptographic device. duepigreco s.r.l. was also the sole Italian representative for Italy for the quantum encryption devices of MagiQ inc. (www.magiqtech.com). In 2006 he started his doctorate at the University of Oxford, and he received his DPhil degree in 2011, defending an experimental thesis with the title “Spectroscopy of Single Colour Centres in Ultra-Pure Synthetic Diamonds”, supervised by prof. Jason M. Smith and prof. Pieter Kok. During his doctorate dr. Grazioso has teached as tutor for Mansfield College’s undergraduate students, for the course of “Fourier Series and Partial Differential Equations”. He has then been postdoctoral fellow at École Normale Superiéure de Cachan (France) until 2012, working in the group of prof. Jean-François Roch, and collaborating with dr. Frédéric Grosshans in several research projects: an experimental project on QKD using NV centres in diamond as single photon source; a device-independent theoretical model of Quantum Random Number Generators; a theoretical description of a robust, sifting-less Quantum Key Distribution protocol, with discrete variables and an arbitrary number of states. From 2012 he has worked as postdoctoral fellow at Université de Montréal, in the Laboratoire d’Informatique théorique et quantique (LITQ) of prof. Gilles Brassard, collaborating with him to extend the complexity model for quantum algorithms beyond the query complexity model. In late 2014 he has started to collaborate as postdoctoral fellow in Roberto Morandotti’s group (UOP), at INRS, working on the quantum properties of the non-linear micro-ring resonator and single photon source recently developed by the group. He has recently been awarded a MITACS Accelerate internship funding. Institut Transdisciplinaire d’Information Quantique (INTRIQ) annual meeting (Bromont , Quebec, Canada). Poster presentation: An introduction to Classical and Quantum Information Theory, and two examples of applications: the Black Hole Information Paradox and the Renormalization Group Information Flow (2014). Theory Canada 9 conference (Waterloo, Ontario, Canada). Poster presentation: An introduction to Classical and Quantum Information Theory, and two examples of applications: the Black Hole Information Paradox and the Renormalization Group Information Flow (2014). Bishop’s University (Sherbrooke , Quebec, Canada). Invited talk: An introduction to Classical and Quantum Information Theory, and two examples of applications: the Black Hole Information Paradox and the Renormalization Group Information Flow (2014). Meeting of the FReQueNCy (Fundamental research in quantum networks and cryptography) project (Waterloo, Ontario, Canada). Talk: A family of BB84-like, sifting-less QKD protocols with N states and robust to photon number splitting attacks (2012). University of Oxford, Department of Computer Science, Quantum Information Sciences Workshop (Oxford, UK). Poster presentation: A family of BB84-like, sifting-less QKD protocols with N states and robust to photon number splitting attacks (2012). École Normale Supérieure de Cachan, Laboratoire de Photonique Quan- tique et Moleculaire (Cachan, France). Internal talk: Introduction to Quantum Key Distribution (QKD) and the presentation of a sifting-less QKD protocol robust to photon number splitting attacks (2012). Università di Napoli, Department of Physics (Naples, Italy). Invited talk: The Barrett-Kok “entanglement by measurement” protocol and its implementation using N V colour centres in diamond with low temperature confocal microscopy (2009). University of Sheffield, Department of Physics and Astronomy (Sheffield, UK). Invited talk: The Barrett-Kok “entanglement by measurement” protocol and its implementation using N V colour centres in diamond with low temperature confocal microscopy (2009). DeBeers diamond conference, St Catherine’s College, (Oxford, UK). Poster presentation: The characterization of single NV colour defects in ultra-pure diamond crystal , and its use to perform the Barrett-Kok “entanglement by measurement” protocol (2008). Italian Quantum Information Science Conference (Camerino , Italy), October 24-29. Poster presentation: The Barrett-Kok “entanglement by measurement” protocol, and its use in the creation of the cluster states, to perform measurement-based quantum computation (2008).